FREE Nature's Variety Instinct Healthy Weight Dog Food Sample! 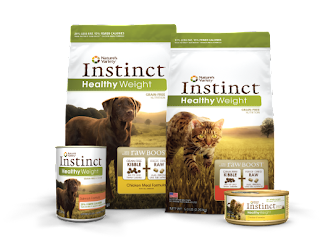 Instinct has continued its commitment to empowering people to transform the lives of pets with the introduction of Instinct Healthy Weight foods for dogs and cats. The specially formulated diets help pets lose or maintain weight. Healthy Weight is available in canned and kibble form. Each grain-free kibble formula is made with less fat and fewer calories, while still preserving the high protein levels Instinct is known for with the added Raw Boost freeze dried raw pieces. Register for a FREE Dog Food Sample of Nature's Variety Instinct Healthy Weight while supplies last (U.S. residents only). Canadian residents complete the form and receive a $4.00 off coupon.